Ela just weighed Mojo, and he's 15.5 lbs. Mojo was ten months last thursday! How about that? 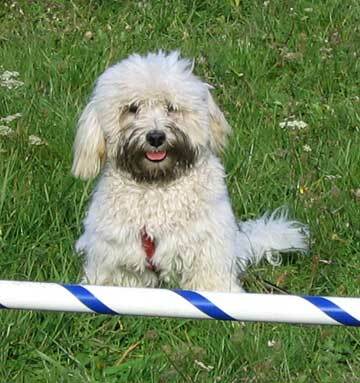 I was just reading a thing about biting on the havanese/yahoo mailing list, and was just thinking that Mojo's started biting a bit. He was biting a lot, then stopped, then started again when his adult teeth came in. It tapered off until almost nothing. Now he kind of bites a little. I wonder why? He also jumps up when he meets people. He's always done that, but he's bigger now. It's hard to remember to tell him to sit down when he meets people. I suppose we should enforce this more. Lastly, his hair is growing in pretty well (as you can see from the pix). The problem now is that his hair's starting to cover his eyes, to the point where we're not sure if he can see sometimes. There doesn't seem to be a good way (besides a topknot) to keep his hair from covering his eyes. One plus with the long hair is that he gets less hair in his eyes. 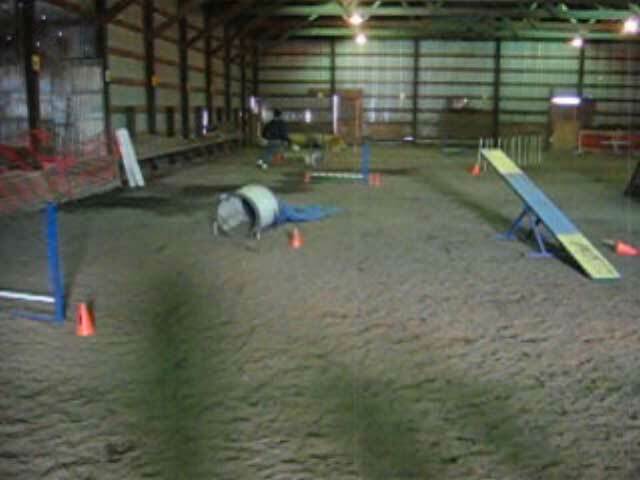 Here are some pictures of the agility course, just so you can see what it looks like. The course is inside a barn, and it's an all-dirt floor. This is Mojo after the first run. He loves getting dirty! 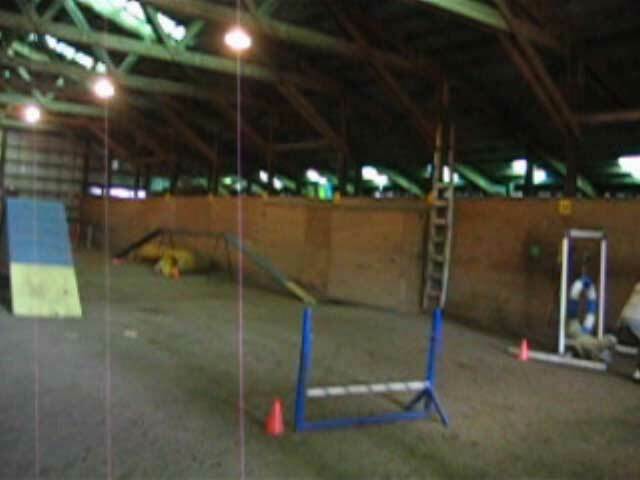 This is the left side of the agility course. That's a tunnel at the far left corner. This is the middle area of the course. This is the right side of the course. The course starts at the bottom left of the left area with the jump, the chute, the next jump, then the poles. From the poles we go to the tunnel in the middle area. The tunnel entrance is on the left, and the dog comes out under the dog walk. From there we go over the A-frame (towards the viewer), then over the jump in the front. 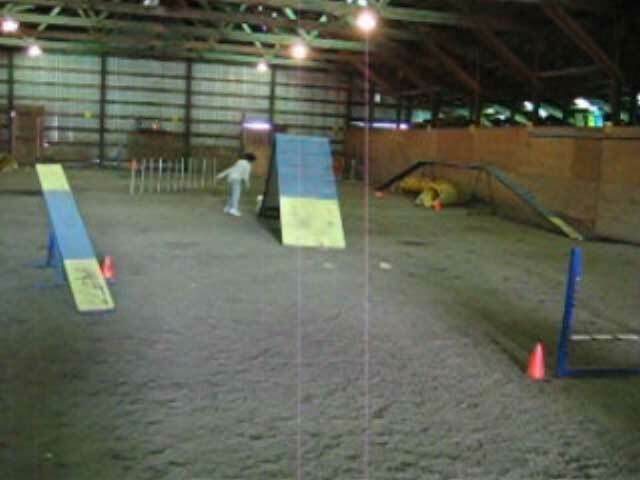 After the front jump is the see-saw, then go over to the left picture and do the two jumps, the tunnel on the back left (rightmost entrance). Then take the two jumps coming back towards the viewer, then cut across to the middle picture to the tunnel below the dog walk. When the dog comes out of the tunnel he goes up on the dog walk, then goes down the walk to the rightmost picture where he goes through the tire. Saturday morning we went to the columbia agility team funmatch, and it was really fun! After not doing any agility for a while, we were a bit rusty. Ela ran first, and I ran second. Mojo had some obvious problems with the chute and the weave poles. He had only seen the chute once before, and well, the weave poles are beyond us right now. But everything else he did, either straight through or with a little coaxing. He went off the see-saw fine (and waited for it to swing down). He went up and down the A-Frame (which was at its full height of six feet). He did the dog walk, also at its normal 5 foot height. He jumped and went through the tunnels, and went through the tire most of the time. The weave poles need serious work, as he was mostly clueless about what to do with them. Everything else he did fine after the second or third run. We stayed after to do a few runs. By the time I ran him he was tired, and refused to go through the tunnels without coaxing. He also did this really funny trot on the way to the see-saw (instead of running). -> jump -> jump -> tunnel -> jump -> jump -> tunnel -> dog walk -> tire jump. One thing for sure, we should never give Mojo food until the end. With food, he gets all excited about the treat and kind of forgets what's happening. The same thing happens at home, actually; if the treat is cheese or something good like that, he starts doing random tricks (instead of the one you said) in the hope that one of them will payoff in the treat.